Gold Tone - Current, not associated in any way with Gold Star; assembled in the USA using a large portion of Asian parts. The OB250 Masterclone is a pretty good deal for the money, also available in gold plate. There is now the option of having the excellent USA made Stull (aka JLS) tone ring ordered, which is a really good thing. This model is referred to as the OB250+ at $1600 list plus case. Furthermore, it is possible to order the OB250/OB250+/250AT (see below, I happen to be fond of archtops too) as a kit. There is also a Bluegrass Special model with a Mastertone style tone ring and hook and shoe pot construction which is very nice. Their entire line has become quite extensive, including mini instruments too. See http://www.goldtone.com. Gold Tone showed a very nice OB250AT 40 hole archtop at the NAMM trade show in January 2002. This is a regular AT tone ring like the Sullivan and prewar Gibson one, not a conversion ring from postwar full height flathead to archtop like the Stewart Macdonald #802. It probably has the 3 ply rim, but I did not ask. This combination of 40 hole ring and cast flange was used on some 30's Gibson archtops. It sounded OK only 2 days old, and the parts had not had time to settle in. Nominally $1200 list + case. Gold Tone gets at least some of their parts (necks) from smaller Korean suppliers than Samick (who also probably sell to Samick), which they say allows more flexibility and choices for their customers. Probably a better profit too at less retail too, so everybody wins except Samick. Greg Bennett - Signature 5-string banjo - Current, Samick like. Quilted maple resonator, maple rim and neck, carved heel, bone nut, pearl type (plastic like Maestrotone?) inlays, Remo clear head, maple and ebony bridge. Gold hardware, bell brass tone ring, engraved armrest, die cast tuners with pearloid buttons, planetary 5th, eagle claw tailpiece. GTR - Japanese masterclone: first offered in 1974 they were sold through approximately 1978. They were made for GTR by Iida. GTR stands for George Gruhn, Tut Taylor and Randy Wood, three dealers/ builders in the Nashville scene in the mid 70's. They were available in one finish only, dark mahogany, with 2 piece flange and flat head tone ring. There were "a few hundred" of them made, but Gruhn has said he doesn't remember exactly how many. Honer - Korean built, fiddle headstock, tone ring, resonator, shoes and brackets on the pot. No harmonica holder noticed. Hondo - Masterpiece HB250TT, seen with carving on the back of the headstock and the heel of the neck. Fiddle headstock with extended top, Bella Voce inlay on head, nickel plate. 590 - economy model, blond maple, diamond inlays, cheaper tuners, friction fifth peg. 591 - natural maple, wreath, curly maple resonator. 591FB - no details other than being left handed. 592 - like 591, dark stained maple finish. 592FB - H&F, natural finish, maple. 592G - 592FB with gold hardware. 593 - vine inlay from 2nd to 15th fret, natural maple. 593BR - 593 with sunburst finish. 1977 model with wild inlay sort of like the Argus has been seen on eBay. Iida - pronounced EE-da. It is a man's name with one pronunciation, though sometimes read as Jida or Aida; the script I looks like an A or J. This is a change from what I previously had here, but a Pedro Martinez has been reported with the words IIDA PATENT stamped in the aluminum pot just to nail the point home; weird since I think Ode, Stewart Macdonald and someone in the 1920's whom I don't recall at the moment (Lange? Ludwig?) also did it first.) - Been around since the 70's. Full line then, from entry to typical Mastertone replica, model 235/ 240 were higher quality ones. They offered a 6 string banjo ala the Sonny Osborne/ JD Crowe motif in the early 80's; 5 long strings with an extra low one below the D and the regular shorter 5th string now being the 6th, still tuned to high g. There was also a lefty at one time. Current Masterclone banjos are very similar to Epiphone or Samick, but cost 50% more. In the '70's catalog it says that Teduo (sp?) Iida (son of the senior Mr. Iida) became enamored of the 5-string and supervised design and construction in their own factory. They were one of the best acoustic instrument builders, esp in the high price range. Model 232 - Current, maple, die cast (zinc?) FH tone ring, 2 pc flange, HF. Wholesaled by Kaman (at least). Model 235. I have examined an (LH) mid 70's Model 235 Iida Masterclone and it is has an aluminum tone ring, multi ply pot, steel two piece flange, and a blackish/purplish finish with the light colored grain filler in the mahogany showing through, two concentric rings in the resonator, rough bare stain inside the resonator. Ugly. Not a very desirable instrument to me, corners definitely cut by the maker. I had no bid it on eBay even though it looked good after massaging the photos. I drove 900 miles up to Idaho to see it, lefties being fairly rare and I needed one....hunch had said not to bid; and hunch was right on. Too bad it was not like the model 240 below, I would have purchased it. I have since seen one with dark color grain filler. 236 - Flathead, apparently brass/ bronze tone ring, 2 piece flange, chrome, inlay pattern is a 2 part stylizes winged/ chevron pointing up, inlays repeated and becoming larger going up the neck. Fiddle cut peghead with inlays of stylized f holes and a stylized eagle coming out of the fingerboard wings motif at the top, also seen with alternate head inlay. The neck is mahogany, resonator sunburst flamed maple on both examples seen.... over all a bit odd. Model 237 - From the 1976 catalog, the model 237 was a top-of-the line flatheads. Cast bell-brass tone ring, chrome, solid maple resonators, 14-ply maple rim, rosewood fret boards, MOP inlays using Gibson's RB-Granada Hearts and Flowers pattern, 2-way truss rod, three-piece maple neck, and checker-board wood marquetry before the ivoroid grained binding. The design borrowed heavily from the RB-800 of the day, but with a Cremona finish that avoided the cherry red of the RB-800 (thank goodness). Model 238 - Likely was a chrome archtop, I have 3 original NOS chromed Iida arch top tone rings. This is a guess as to model number. Model 240 - From the 1978 catalog, the model 240 (archtop) was their top-of-the line archtop. It had cast bell-brass tone rings, solid maple resonators, 14-ply maple rims, rosewood fret boards, MOP inlays using Gibson's RB-3 wreath pattern, 2-way truss rods, three-piece maple necks, and checker-board wood marquetry before the ivoroid grained binding. The design borrowed heavily from the RB-800 of the day, but with a Cremona finish that avoided the cherry red of the RB-800. A satisfied owner writes : I have a model 240, in which they attempted to clone a RB-800 in all its gold glory with wreath inlay patterns on the rosewood fretboard, clamshell tailpiece, 20-hole bronze or brass arch-top tone ring, two piece flange, dual brass(?) coordinator rods, white and checkerboard binding along the neck and sides of the resonator, dual concentric ring inlays on resonator with a sunburst finish, etc., maple(?) neck. 6 or 7 ply laminated maple rim. The truss-rod cover says "Custom Built" in script. No other markings or numbers, other than the Iida inlay in the headstock and where "Mastertone" would appear at the last fret. Came with a 5-star clear head; nicely built (still solid as a tank and holds adjustments well), but a little too-much high frequency overtone which I have learned to control with a heavier tailpiece and thicker compensated bridge. I believe I paid about $700 for it new from a Milwaukee music store in 1978 (as a young man with more money than sense). It has proven to be a good banjo over the years. Kasuga - An owner writes "It's a mahogany 3 copy with Reno pattern inlays. Some of the peghead pearl looks like abalone. Two rings and purfling on the resonator. Tone ring is a 20-hole flat and is heavy enough to be brass or bronze.. Hardware is nickel plated. Tailpiece is a Presto copy. Flange is 2-piece. 2 coordinator rods. Rim appears to be 5 or 6-ply maple. One piece armrest. The neck feels just like the original one on my old 3, but plays easier because the frets are lower and slightly wider. It sounds OK - has a nice bottom end but overall is a little thin sounding. I'll bet a good tone ring could turn it into a killer. I like to play it, because hammer-ons and pull-offs are so much easier and cleaner because of the frets, unlike my old banjer which will work you to death. I'd never even heard of a Kasuga until I saw this one, and I was really amazed at the quality. Unfortunately there are no identifying marks (serial number, label, etc) other than the name in the peghead (double-cut, by the way). If this banjo is representative of their overall quality, maybe Kasuga should be included in your top 20." Model RB-600 (serial# 0247) is a Gibson RB-250 type banjo, purchased in Japan in 1978. Other models, presumably upscale, were RB-800, RB-1000, RB1200. I believe the Reno inlay one above is one of these. There is a H&F version with no 15th fret inlay, mahogany, 2 piece flange, double cut peghead, eagle claw tailpiece, nickel plate. There was a model with an aluminum tone ring and one piece flange. Putting in a cupric tone ring from Stew Mac or 5th String was an easy swap, and yielded a good intermediate banjo. Kasuga also had some very nice F-5 style mandolins including the F-5 type model M-120 in late 70's, similar to Ibanez. Kentucky - Gold Star GF100 pots, late RB3 (not wreath 3) pattern one piece mahogany neck. About 50 made starting up again in 83 with a different maker after the production difficulties caused GS to end production at the Tokai works in late 81/ 82. Could have been made with left over GF100 pots from Tokai production. 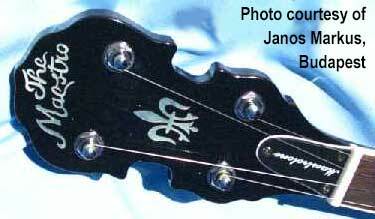 I have only seen one, logo was exactly like the Kentucky mandolins, made at the Kentucky works in Japan. Very nice banjo, Gold Star like (naturally). See Gold Star also.